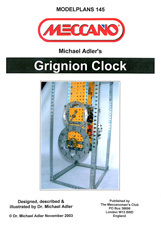 Michael Adler's clocks are seen at every Meccano exhibition and represent the leading edge of Meccano horology. 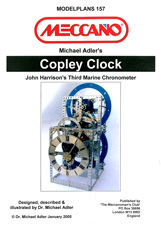 Michael Adler has been building Meccano Clocks for over 20 years. 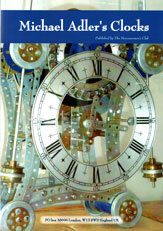 The inspiration for the clocks came during a visit to the Royal Observatory at the National Maritime Museum, where he saw John Harrison's first marine chronometer working, and wondered if it could be built in Meccano. 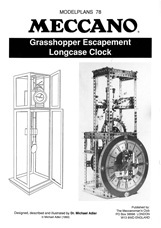 It was the start of a fascination with clock escapements which has remained with him ever since. Seeing an interesting mechanism come to life has always been a challenge, one equalled in many ways by the pleasure of documenting it by description, photography and computer generated drawings. 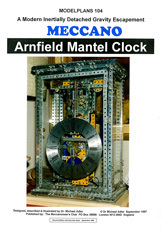 The result will provide inspiration and enjoyment to the Meccano clock building enthusiast. 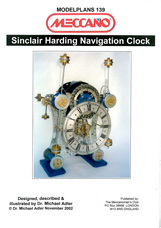 All 10 clock modelPlans are now available as a single publication, available in paperback or on CD, with photographs, building instructions, background information, inserts and diagrams. 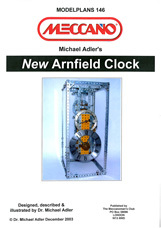 Ref: MACH Price: £32.95 + shipping (Australia/New Zealand £10.50; Rest of World £6.50). CURRENTLY OUT OF PRINT. ADVANCE ORDERS FOR NEXT PRINT RUN CAN BE PLACED NOW. 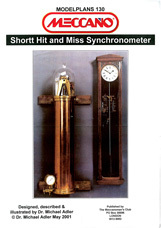 CD Scanned in high-resolution .PDF format which can be read on-screen or printed, for PC or Macintosh. 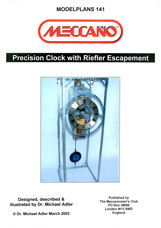 Includes video footage of MP179. Ref: MAC Price: £29.95 (Shipping inclusive).